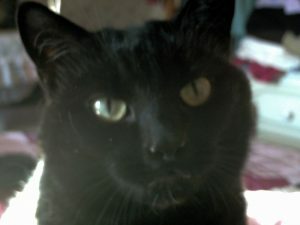 If someone asked me as a psychic medium “Will my deceased pet return from Spirit Realms I would say definately yes. My deceased pet returns from spirit realms, when she feels like it and not from any beckoning from me. Yesterday while working on my psychic email readings, a weight landed next to me, but I couldn’t see anything, then the photo of my deceased cats, on the wall above my head, started to move gently from side to side, for a good few minutes. I swear that is what happened. All I know is, I sensed the cat and that she, was a she, was big and heavy, and my table shuddered, with the landing. Who says our beloved pets cannot and do not come home from the Spirit realms and when they are dead they are dead. What utter nonsense. Like our spirit humans the continuity of life is eternal and I truly beleive that all my cats and dogs will be waiting to greet me along with my human family, when it is my turn to go home to the Spirit lands. In the first week of my latest cat Fluffys, passing, I was taken over to spirit in astral travel, and there I saw all my animals including a tiger, a badger, unbeknown cats and birds in the trees. The grass was long and all the animals looked so happy and content and of course pleased to see me as I sat under a tree. In the bible it quotes “that the lion will lie down with the lamb” and that was certainly the case here. I often see my labrador and st bernards dogs too but in my mind as I couldnt imagine, one of there landings on my table. My visit to Spirit, also proved to me that the spirit realms seem to be higher by about 3 feet and I have certainly heard other mediums discuss this. Maybe this is why a lot of sightings of humans are with no feet. Just a thought but as with all things spiritual there will be plenty to think about. I believe that our language is universal and is scrambled in the universe for all to understand ie humans and animals. If you would like to communicate with your pet in spirit please contact the lady below. I have read Jackie Weavers books and would recomend you read them to help you cope with your loss.